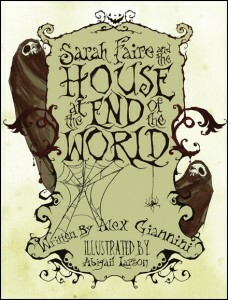 While you haven’t quite reached the end of the world, you have reached the home for all things Sarah Faire on the web.Written by Alex Giannini (that’s me!) and with stunning illustrations by Abigail Larson, Sarah Faire and the House at the End of the World is the first book from Dead Letters Press NYC. Sarah tells the story of a young girl who must face her darkest fears to save the life of her friend. We think Sarah’s a cool little book, and we think you will, too. So, welcome to the world of Sarah Faire! You can stay up to date on all the latest happenings with the book by checking in on this very blog, as we’ll update regularly. There’s some exciting news coming soon, so stay tuned!